As we continue on our journey to all the National Park sites in our state of Missouri, our next stop is Fort Osage National Historic Landmark, a reconstructed fort which sits on a bluff above the Missouri River in Sibley, Missouri. Following the Lewis and Clark Expedition, the United States government wanted to set up a system in which they would interact commercially with the Native Americans encountered by the Corps of Discovery on their long journey west. France and Britain were already involved in trading relations with the natives, as were the various tribes with each other. At the same time, the United States needed more land for its ever-westward moving population, land that had, for centuries, been inhabited by native peoples. The best way to accomplish this would be to “civilize” the natives…teach them to live as an agricultural society on smaller spaces, dependent on trade and government protection. To these ends, the US government built Fort Osage, and William Clark signed the Osage Treaty of 1808 with the Native American people living in the area governed by the fort. Under the terms of the treaty, the Osage ceded land to the United States, while the government promised to protect the Osage people. First, let’s take a look at the trading site. The “Factory” was a store, so to speak, where trade with the Osage would be conducted. Furs were the item the Native Americans provided in exchange for such things as blankets, guns, tools, and cookware provided by the Americans. As time went on, the Osage were encouraged to start small business ventures, such as candle-making. The candles would be traded to the factory. The factor, or “storekeeper” would then sell the candles to other retail businesses in the United States. Business with the Osage was conducted by the barter system. All the furs and other items brought in by the Osage were traded for things they wanted. No real money was ever given to the Osage in exchange for any items. The Factory, the “store”, was built inside the main gate of Fort Osage. The factory opened on October 1, 1808. The factor at Fort Osage was George Sibley. A view inside the living quarters of the factor, the “storekeeper”. The dining area for the factor, his family, and guests. The kitchen inside the Factory living quarters. Now let’s take a look at the military fort. The purpose of the military fort at Fort Osage was to protect a portion of the Louisiana Purchase that sat in the Missouri River Valley, provide protection for the Osage if they needed it, give protection to the United States Factory Trade House within its gate, and to provide a safe place for travelers and settlers to stop, get needed supplies, and rest on their way west. Its commander was Captain Eli B. Clemson. 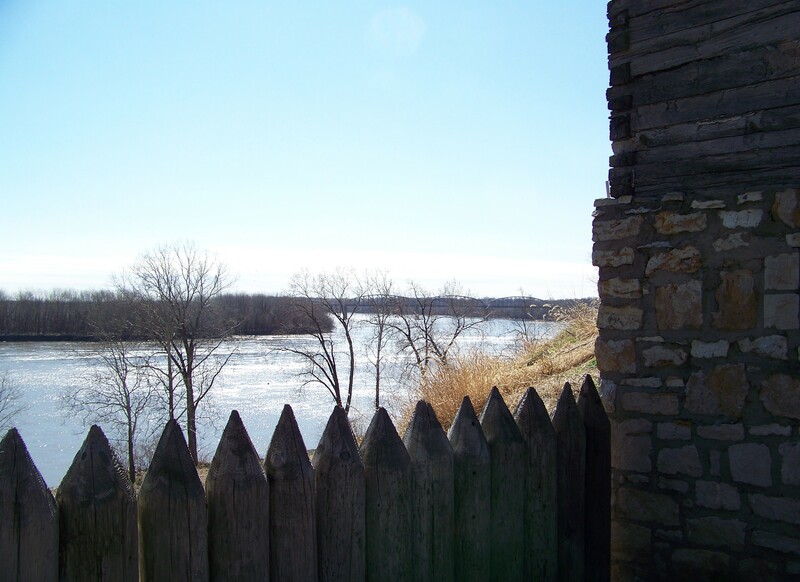 The fort had a commanding view of the Missouri River from this bluff. Fort Osage flew a 16 foot by 24 foot US flag with 15 stripes and 15 stars from a flag pole that was 90 feet tall. One ship captain, upon arriving at the fort, said he could see that flag from six miles downstream. The Officer’s Quarters at Fort Osage. A look at the Missouri River out a porthole in one of the blockhouses. Loopholes in the blockhouse… At times the smoke in the blockhouse, from the firing of muskets, would be so thick the soldiers would have to “look for the loophole”…and now you know! Fort Osage was in operation from 1808 until it was closed in 1811 in the wake of the War of 1812. It was reopened following the war with George Sibley returning as factor. But by 1822, private traders wanted to conduct all the business with the Native Americans. These private businessmen lobbied Congress to end the Factory System and government competition. This, and the fact that settlers were moving the frontier farther and farther west all the time, resulted in the permanent closure of Fort Osage in 1827. Fort Osage National Historic Landmark is owned and operated by Jackson County Parks + Rec. It is staffed by site interpreters and volunteers dressed in period clothes who possess enormous knowledge about the site and its history. When we visited, on a late autumn weekday, we did not run into too many other visitors. That was great for us, because the “factor” spent over an hour with us, answering every question we had, offering answers to questions we could not even think of, and providing anecdotes about the fort and the people who once lived there. The fort is open Tuesdays through Sundays, from 9 a.m. to 4:30 p.m., year round. You can learn about the fort and plan your own visit to the fort by visiting its website at http://www.jacksongov.org/fortosage/. Have fun finding our National Parks…in and out of your own backyard! 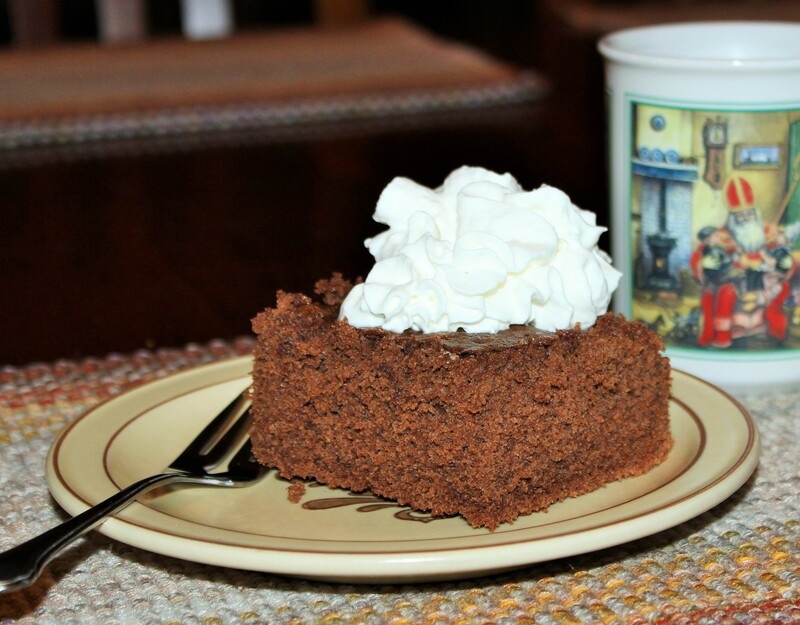 This delicious chocolate cake, with a kick of cinnamon, is great with a fresh cup of coffee. While the original recipe calls for the cake to be topped with a creamy white icing, we love it with a very generous dollop of whipped cream. I can honestly say that our two favorite cakes come from old recipes in heritage cookbooks, and this is one of them. I have adapted the recipe from “An Army Wife’s Cookbook”, compiled and edited by Mary L. Williams, and published by Fort Davis National Historic Site, a part of the Southwest Parks and Monuments Association. Cream the butter, then thoroughly mix in the cocoa. Add the beaten egg yolks. Mix the cinnamon and cloves with the sugar and add to the batter. Beat well. Sift together the flour and baking powder. Add the dry ingredients alternately with the egg white and water mixture. Bake in a 9-inch square pan at 350 degrees for 25 to 30 minutes.